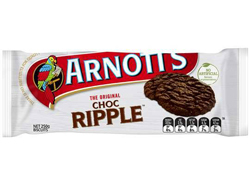 A chocolate flavoured cookie that is an essential and irreplaceable ingredient to the Aussie classic Choc Ripple Cake. Each packet contains approximately 28 cookies and has the recipe for the choc ripple cake on the packet. Wheat Flour, Sugar, Palm Oil, Cocoa Powder, Golden Syrup, Baking Powder, Food Colours (Caramel III), Salt, Emulsifier (Soy Lecithin), Natural Flavour, Antioxidants (E307B from Soy). Yes I agree, I have tried and tried to find Chocolate cookies that are good as these. I just cant be done! If you want the chockie ripple cake its got to be these bickies only. These biscuits are delicious - delightfully crunchy, with a rich, chocolate taste. They are also an essential ingredient in that classic Aussie dessert, Chocolate Ripple Cake. I have tried without success to find a suitable alternative, so will just have to keep Sanza in business, supplying me with these biscuits!